With thousands of acres of State and Federal land made for winter fun, there is no place like Crawford County when it comes to snowmobiling. Marked trails are groomed by the AuSable Valley Snowmobile Association. One of the largest trail systems in the state links the Grayling area with Lovells, Lewiston, Frederic and Gaylord. Other trails connect to Roscommon and Houghton Lake. A full color snowmobile map is available for the area. In the heart of the snowbelt, Grayling offers the first good snowmobiling for winter fun-seekers heading north. The easy accessibility of Crawford County from I-75 and U.S.127 means snowmobilers spend most of their weekend on their sleds, not in their cars. Enjoy a day touring the forested, rolling terrain and spend the evening relaxing at one of the many restaurants and comfortable lodging facilities. Rental, sales, storage and repair services are available at local businesses. Make Crawford County the place to center your snowmobiling trip. Everything you could ask for in a winter snowmobiling weekend can be found here, so plan to join us for a true winter experience! Trail conditions are available by calling the Grayling Visitors Bureau at 1-800-937-8837, or by entering our web site under “Trails, Snowmobiling, Updates”. To receive email updates on snow conditions, sign up under “Contact Us, Mailing Lists”. “Like” us on Facebook at Grayling Visitors Bureau or follow us on Twitter @Graylingmi. 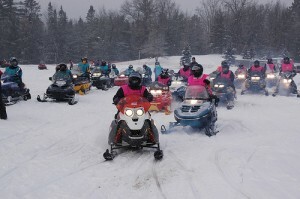 The AuSable Valley Snowmobile Association, “Volunteers for Better Trails”, work diligently to maintain a pleasant, safe riding experience for everyone. When you’re out riding the trails, please think of these hardworking folks and respect their efforts. Many volunteer hours are spent by a handful of people to insure that your snowmobiling experience is a terrific one. When encountering groomer vehicles on the trails, please slow down and stop off the trail. Look for and obey the groomer driver’s signals to pass. Remember that all of the groomer drivers you will encounter in our area are volunteers. 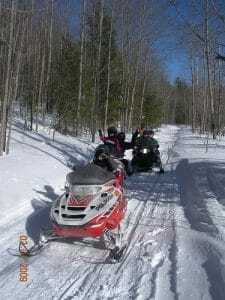 Take the time to visit the AuSable Valley Snowmobile Association website. They are an all-volunteer group who do a great job of grooming, trail maintenance and upkeep. The directions for this connector are… From the south end of Grayling the trail heads north in front of the Grayling Ramada Inn and Day’s Inn, turning west onto Golf View Drive. Travel on Golf View for approximately fifty yards; at this point, turn right and resume traveling north behind Family Fare and the Grayling Mini Mall. The trail continues north accessing the Grayling Country Club and tying into the west side of the railroad grade. 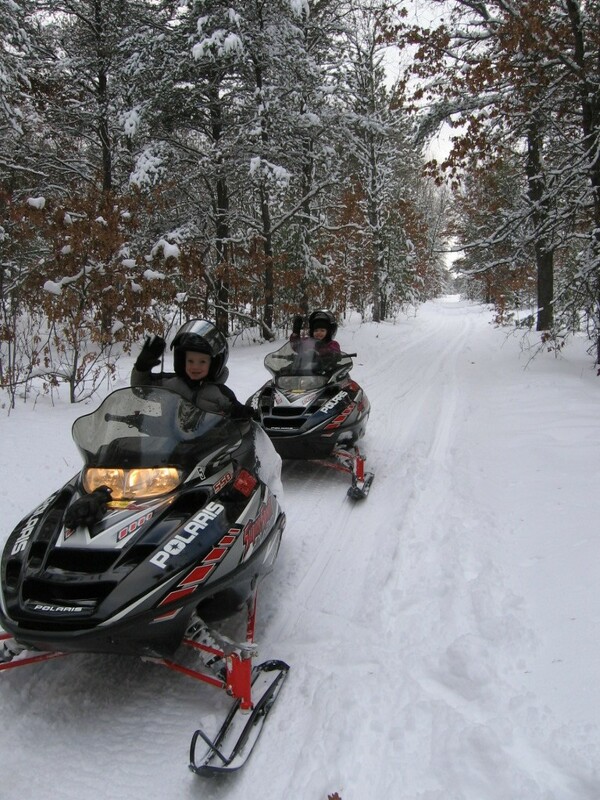 Follow the trail along the railroad tracks to the Crawford County Building and pick up the trail maintained by the AuSable Valley Snowmobile Association. Please stay on the trail, drive slowly, respect private property and ride safely. Due to the width of the connector, it is not groomed. Not all streets in downtown Grayling are open to snowmobiles. It is possible to access several gas stations, although the roads are paved and plowed. Many snowmobilers use the more accessible gas stations at Charlie’s Truck Stop (4 Mile Road just south of Grayling) and in Frederic. Snowmobilers may access the alley behind the businesses located on the south side of Michigan Avenue to go to Spike’s Keg O’ Nails. You must exit through the alley upon leaving to get back to the “Trail Through-Town Connector”. Do not ride on any city sidewalk. If you would like a copy of city ordinance or a copy of state laws, please send an email to visitor@grayling-mi.com and we’ll be happy to mail the information. The AuSable Valley Snowmobile Association, in cooperation with the DNR, has implemented an Emergency Trail Location system that will assist the Emergency Services of Crawford County in the event of an accident on the trails in our area. The system consists of signs that designate the trail number that you are on followed by a location number. The signs can be found at all road crossings as well as along the trails. It is important to remember that these numbers are not a “mile marker” system. These locations are mapped with GPS coordinates and allow the Emergency Services to easily locate those in need of assistance. Simply dial 911, tell the operator you are in Crawford County and give them the number on the nearest locator sign. This is a list of major areas of concern for snowmobilers in the local area. It is not a complete list of state and local laws. For more details see the Crawford County Sheriff Department Website. Snowmobilers will be ticketed for riding on the hills on M-93 before Camp Grayling. Stop signs on the trails are legal signs and must be obeyed. Do not ride on the shoulders of any state roads, such as “M” roads like M-93 and M-72 and the I-75 Business Loop which begins at the Ramada Inn and continues through town north to M-93. Follow the posted speed limit on county roads. Follow state laws, such as going with the flow of traffic. There is no riding at the posted area west of Grayling at the hilly area off of M-72. There is an area north of Cameron Bridge Road in Frederic posted “No Trespassing” that numerous sledders have been riding in. DNR Officers are ticketing anyone found riding in this area. Again, this area is north of Cameron Bridge Road off of Iswana Trail and is heavily posted with signs and stump barricades. There are also several fences. The pipeline crosses private property in this area, and is strictly “no trespassing”. Please, do not ride in this area – go north through Kalkaska County about one mile to re-access the pipeline. Also, do not ride your sled anywhere in the 5000 acre Deward Area located west and north of Frederic. Please follow the laws, rules, and use common sense – we don’t want anyone’s weekend ruined because they broke the law and received a ticket.